We have a variety of standard, premium, and economy view binders in every single size you could need! These 3-ring binders are an excellent solution for all your presentation needs. You can customize presentations and proposals simply by inserting printed sheets in the front back and spine. Available in both round ring and D-Ring configurations and in a number of awesome colors. Shop by the size of binder that you need or browse based on the construction of the binder (good/economy, better/standard or best/premium). Can't find what you are looking for? Give us a call and we will help you out. White matte finish view binder. D-rings hold 220 to 800 sheets of 20lb paper. Black matte finish view binder. Black heavy duty cover that frames clear overlay. Navy blue heavy duty cover with clear overlay. 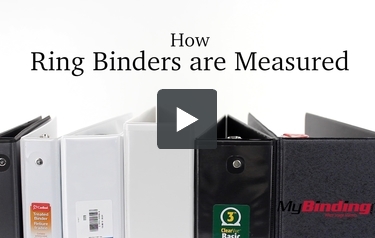 How are Ring Binders Measured? Mybinding.com presents How Ring Binders are Measured. These binders are all labeled different sizes from 5/8 of an inch to 5 inches. But what does measurement actually mean? Well, they are not all the same but they are referring to the ring sizes. For round rings, the measurement is the diameter of the inside of the rings. For slant or D rings, it is the length of the straight edge. Then 5 inch binders come in and ruin everything they’re measured from cover to cover and not by the ring sizes. Imagine it being more like how big of a stack of pages you can fit in your binder and not a measurement of the thickness of the binder itself. If you are curious, here are some approximate cover widths for the corresponding ring sizes. You can see that a 5/8 inch ring binder is actually slightly over an inch thick, and a two-inch binder can be almost 3 inches thick.